The best way I’ve learned to make a difficult decision is to flip a coin. The idea’s taken from a poem by Piet Hein. You’re not flipping the coin to leave a tough decision up to chance. You’re doing it because while the coin’s in the air, you’ll know which outcome you should go for, because of which side you hope lands face up. It’s not foolproof by any stretch. But it’s quick. And it taps into your intuition. In recruitment, decisions are mostly made by your clients and candidates. Ultimately, they’re the ones that choose whether a placement’s going ahead or not. And so your role’s more about influencing the process as best you can from your bird’s eye view of the market. Which in many ways, means the decisions you make hold more weight. Deciding who’s going in your shortlist. And who isn’t. Which companies to approach. And which to avoid. How to tailor an application, pitch to win new business, or whether to leave the company you’re with. You make decisions on how you spend every minute of your day. And subsequently, your career. And these choices have a profound impact on your life and the lives of the people you do business with. Decision making at this level’s worth a wee bit more than flung change. So here are five TED Talks about how to make decisions better. Ruth Chang had a difficult career choice to make: become a lawyer or a philosopher. She got her BA from Harvard Law School before pivoting to become a Doctor of Philosophy at Oxford University. Over 7 million people have watched Ruth dispel the misconception that hard choices are important. Or that we’re not bright enough to make them easily. When we’re making a hard decision, it’s often because “there is no best option”. The problem arises when we overvalue the choices in front of us. Like picking a career path; or narrower than that, choosing a company; or narrower still, a specialism within the organisation. We then agonise for ages over which option is better, worse, or equal to the rest. Instead, Ruth posits a fourth alternative: that choices can be “on a par” with one another. Neither better, worse or equal. But a way of thinking that allows us to throw ourselves behind the choices we make. By creating reasons for doing something, as opposed to waiting for them to become clear. Ultimately, Ruth argues, this is how we become the people we choose to be. It’s something you’ll weigh up for yourself probably only a handful of times throughout your career. However, you’ll be having conversations with candidates on a daily basis asking them to make a similar decision. Send the link to any candidates you’ve got under offer who’re tempted to flip a coin for their future. Tom Griffiths is Director of the Computational Cognitive Science Lab at Princeton University. He talks about applying the principles of computer science to a number of common human problems. Take the example of deciding on which restaurant to eat at. You’ll encounter what computer scientists refer to as the “explore/exploit trade-off”. On one hand, you could explore the options in town and try a place you haven’t been to before. On the other, you could exploit the choices available to you, ie: settle for what you already know’s good. As Recruiters, we encounter the same thing when it comes to business development. Should you explore your market, tap up a company you’ve not worked with before and learn something new? Or work with the same clients on the same roles you’ve filled in the past? Logically, the best question to ask yourself is: how much time do I have? Because it’s about doing what makes the most sense in the least amount of time. Which basically makes this a talk about choosing when to work SMART. And raises points about how a logical, decision making machine would perhaps behave in recruitment. Jason Shen’s the co-founder and CEO of performance hiring platform Headlight. In this talk, he tells the Brian Acton anecdote: after Facebook turned Brian down for a job in 2009, he co-founded Whatsapp and sold it to them for $19 billion, five years later. An expensive decision, however you look at it. But could it have turned out differently if Facebook knew what Acton would eventually achieve? Would a more robust hiring process have unearthed his potential early on? Or should Brian have done more to sell himself from the outset? There’s the odd sweeping generalisation throughout this short talk. “The hiring systems we built in the 20th century are failing us” being a prime example. 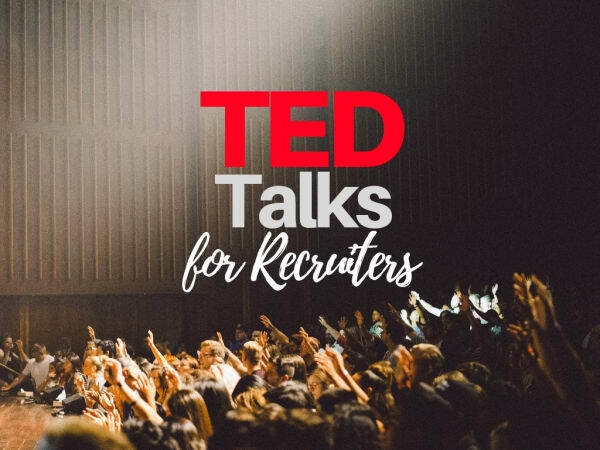 But cut through the bluster and there’s some interesting questions being asked about hiring decisions of the future that Recruiters have the potential to influence today. As technology continues developing, at some point we’ll be doing jobs we didn’t study for. Our candidates will too. And our clients will need to hire outside the box as well. In fact, the main decisions you’ll need to make will be how to adapt your services in a changing workplace. Who are you going to hire: the silver spoon or the scrapper? Regina Hartley’s the VP of Human Resources at UPS and will celebrate three decades with the company later this year. She’s also a self-proclaimed scrapper. What first appears to be a talk about why it’s important to at least interview the underdog, turns out to also be Regina’s story about how the decisions she’s made throughout her own life and career have defined who she is. Unconventional candidates don’t always make the most impressive CVs. But often, they’re the ones that add the most value to a business. Where others see a string of disparate roles, Regina might see sacrifice, hard work and the struggle against adversity, for instance. So choosing the underdog’s not just something to bear in mind when deciding who’s calls to return, who to screen or who to put forward for a role. It’s also something to push back on your clients when they reject your scrappers. And a reminder in general that when it comes to making decisions, sometimes the less conventional option turns out to be the most rewarding. This is an exceptional talk. And if the man giving it wasn’t so composed, I’d describe it as barnstorming. Which isn’t a word I ever thought I’d used to describe a 9 minute lecture about search engines. Andreas Ekström’s a keynote speaker and a staff writer at Sydsvenskan, a Swedish newspaper. He tells the story of how Google handled racist abuse levelled at Michelle Obama. And contrasts this with the way they responded to a campaign to replace pictures of a notorious terrorist with images of a dog turd. His central point is that algorithms aren’t free from bias. And humans are behind every single one of them. They decide how to value search results. And when we make decisions off the back of those searches, we absorb that value to a lesser or greater degree. In the case of Google, it’s popularity has set the standard for how people expect a search engine to work. And as a result, search bars in CRMs and social networks mimic its functionality. Due to Google’s size and popularity, it needs to be held to a higher standard. Particularly because it’s extremely easy to manipulate, apparently. I wrote an article the other week titled How Much Tech Should You Use? and the answer was basically ‘all of it’. Within reason. The decisions we make off the back of using software we either aren’t fully cogent of or in control of need to be evaluated. And the separate decision on what tech to bring into the workplace and when also needs extra attention. Choosing what tech to bring into the office is one key decision. How to use it’s another. And what to do with the results are another. Making those decisions collectively is what will define the future of our industry over the coming years. In the meantime, you could choose to have a look at who’s hiring on Hunted at the moment. Or if you’ve decided you need more TED Talks in your life, we’ve got you covered.